Tune in live to see meaningful and research-based discussions surrounding peatlands, including national and sub-national exchanges, climate change and community engagement. Click one of the session below to watch the video archive. 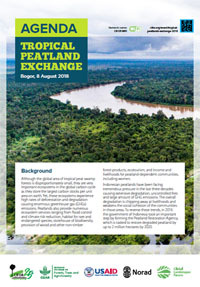 The Center for International Forestry Research (CIFOR) with the support from the Government of Indonesia and participation of private sector is organizing a one-day event to provide platform for exchanges of information between stakeholders concerned on the sustainability of tropical peatlands in Indonesia. The outputs of the Exchange can be scaled up to explore the possibility of engaging broader partners and countries for a more effective south-south co-operation to tackle challenges around peatland conservation and restoration. For more information visit CIFOR's Peatlands site. CIFOR has led global research on peatlands for more than 20 years. Explore CIFOR's extensive collection of publications, projects, toolboxes and more on the CIFOR Peatlands site. Arief Darmawan, UniLa. Will One Map Policy accelerate peat land restoration?